Decour Soft is a fresh serif & soft edges typeface created by Jorge Cistera and published by Latinotype, a slab serif version of Decour. With a humanist touch, it is available in 7 weights matching italics, strong curves and useful OpenType Features. Decour Soft can be use for a variety of project types, logo, packaging, magazine, book title etc. Use the soft type touch of Decour Soft! Price: starting from $26 for one font, to $159 for all 14 fonts. 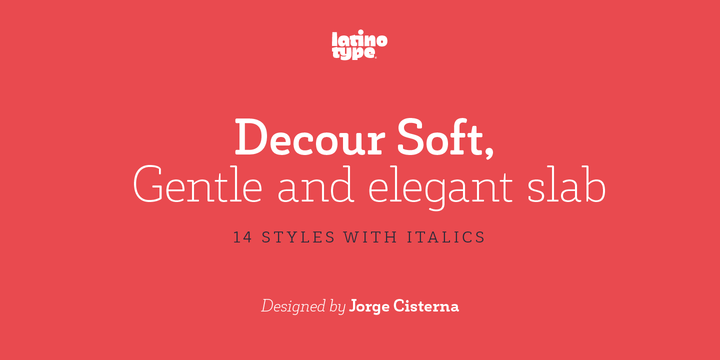 A font description published on Tuesday, November 24th, 2015 in Fonts, Jorge Cisterna, Latinotype by Alexandra that has 3,112 views.